Choosing your wedding dress is undoubtedly one of the most fun parts of planning a wedding – but it’s also among the most expensive. So how do you like the sound of getting all the good stuff minus the paying money part? 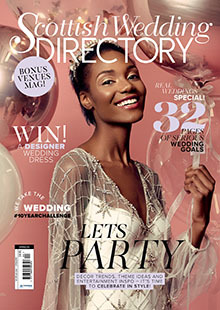 To celebrate its 30th birthday, June Brides is offering one lucky SWD reader the opportunity to do just that. This Glasgow boutique has been making Scottish brides’ dreams come true for three decades with its winning combination of beautiful wedding dresses and attentive customer service, and if you enter our competition, you could be walking down the aisle in one of its premium designer gowns. And it won’t be just any designer. You’ll have your pick of any dress to the value of £1,500 from the luxurious Eternity Group. There’s Eternity Bride, a collection centred around romance and timeless elegance; Art Couture, which takes inspiration from Hollywood glamour for vintage loving brides; and Christina Wu Love, a stylish plus-size range for curvy women. Whatever look you’ve got in mind, you’re guaranteed to ﬁnd a gorgeous gown that’ll turn your vision into a reality. No idea what style of wedding dress you’d like? You’ll have your very own consultant on hand during your private 90-minute appointment to help whittle your options down. With their encyclopaedic knowledge of bridal trends and decades of expertise, June Brides boutique owners Carol and Hollie love nothing more than helping women ﬁnd a gown that truly ﬂatters them. You’re going to look incredible. Win an Eternity Bride wedding dress from June Brides up to the value of £1,500!